Laissez-faire economics is defined as a situation with minimal government intervention. Under laissez-faire, governments and regulators ‘leave alone’ private firms to allow them to make decisions about production and output. In particular, laissez-faire involves zero / minimal government intervention on issues such as regulation, taxes and tariffs. Laissez-faire is a French term and is said to have originated in the Eighteenth Century. French industrialists were asked about the optimal policy for the French government to help business and the term ‘laissez-faire’ was used in response – translating as – ‘leave us alone / Let do and pass). The phrase is traditionally attributed to the French businessman Legendre. Responding to a Mercantilist minister Colbert. (‘Que faut-il faire pour vous aider?’ asked Colbert. ‘Nous laisser faire’ answered Legendre). Laissez-faire stood in contrast to the Mercantilist theory of trade which advocated accumulation of gold and placing tariffs on imports. Laissez-faire was also a reaction against the perceived incompetence and bureaucracy of Eighteenth and Nineteenth Century states. The principle of laissez-faire and minimal government intervention was important in the development of classical economics and became a founding teaching principle of economics. Adam Smith seemed to give more intellectual credence to laissez-faire economics when his writings (Wealth of Nations) showed how if individuals pursue their own self-interest in can end up being for the public good. This seemed to be justification for minimal government intervention and leaving economies to the invisible hand of the market. Laissez-faire economics usually advocated some government intervention – even if just restricted to the protection of private property and maintaining the rule of law. It avoids the distortion of tariffs and welfare loss. Free trade is an important principle of maximising economic welfare and enabling countries to mutually profit from trade. It avoids the inefficiency and possible corruption of heavy government intervention in markets where bureaucrats have limited information. Creates market incentives. The main principle of laissez-faire economics is that entrepreneurs, workers and firms have an incentive to work hard and create goods that consumers want. Inefficient firms will tend to go out of business, creating a dynamic of creative destruction and increased efficiency. Can lead to inequality of wealth and income. Wealth and opportunity tend to get inherited, and those with limited opportunities, struggle to compete against established interests. Far from creating an equal playing field, laissez-faire enables powerful vested interests to dominate wealth and income. Monopoly power. Adam Smith raised the problem of monopolies, which can arise under an economic system of laissez-faire. Monopolies can charge higher prices, restrict supply, and those firms with monopsony power can pay lower wages to workers. Adam Smith was also critical of some aspects of capitalism. He noted that in capitalism, landlords could gain a passive income from mere ownership of property. This could make them lazy and indolent. Public goods and positive externalities. The principle of laissez-faire economics might work for markets without externalities. But, goods with negative externalities, (e.g pollution) will be over-consumed, and goods with positive externalities (e.g. education) will tend to be under-consumed. Public goods may not be provided at all. Keynes wrote an important tract “The End of Laissez-faire” (1926) in which he advocated a mixed economy, making use of capitalism, but also examining the role of government intervention on a case by case basis. 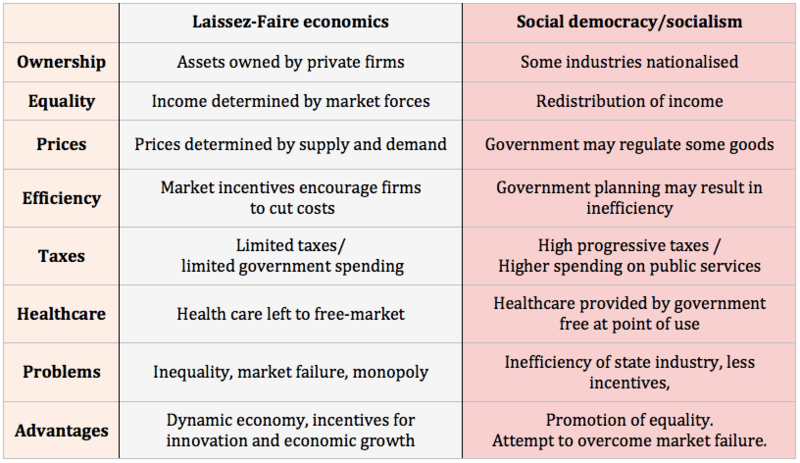 Although most economies have converged towards some kind of mixed economy, the principle of laissez-faire economics still influences aspects of economics. 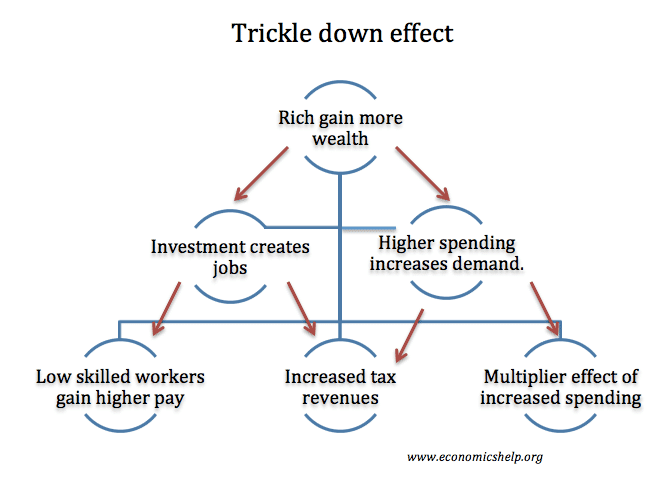 Trickle down economics. Popularised in the US under Reagan, the idea that allowing private business to make money is in everyone’s interest as if business become successful, this will ‘trickle down’ to other people. Arguments for tax cuts and removal of regulations, such as labour market regulations. To what extent should the government intervene in the economy? encouraged to allow a free market reducing monopolies.